For our second Extra Virgin Pizza outlet, we took key elements from the first design such as the hand-made red and green ceramic tiles, pine veneer and red color band dividing the upper and lower levels of the space and integrated them further into the design to reinforce the brand identity and create a design that could be potentially replicated to several other planned outlets. 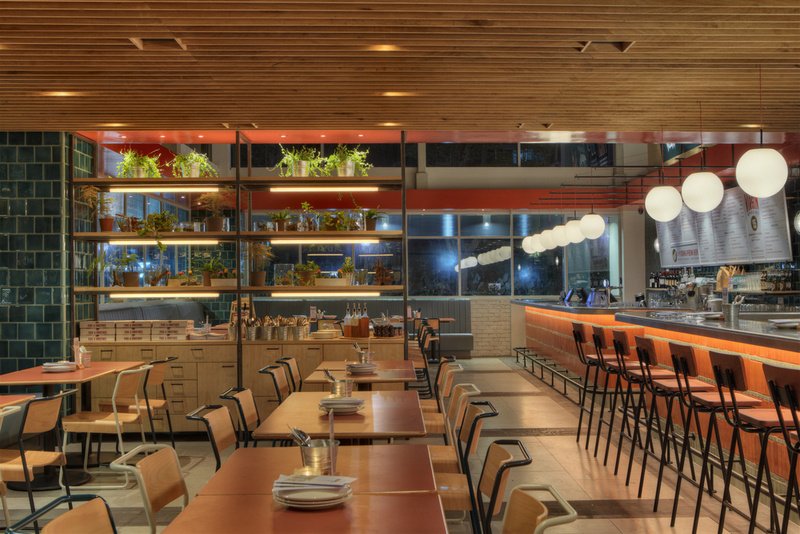 The restaurant is divided into two areas, one with a double height space and the other with a lower ceiling partially concealed with strips of stained plywood. Two separate counters run across the length of the restaurant, one as the ordering station and the other with the open kitchen and counter seating where the pizzas are prepared.